This guide will explain how to set up meshes for export into Torque3D. While Blender is used here it is simply intended to show the correct object hierarchy, usable with any program which exports to collada. This is not intended as an art tutorial or help on using a modeling program. 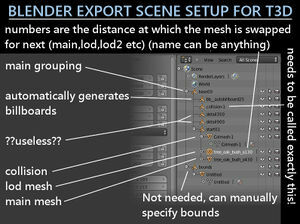 The image to the left shows the correct object hierarchy to use to export an object to the game. To use this all you need to do is append (Blender) the objects from your main file to this and join them to the existing "object_***" objects. If you need more you can simply duplicate the existing objects. The numbers at the end of "object_" are point at which the current mesh will be swapped out for the next lowest numbered mesh (the highest is your main mesh, the lowest is your most simple LOD). This is a measurement of your mesh in pixels. To get a better understanding of how this works, open up an object in the game in the Shape Editor and use your mouse wheel to zoom in and out of the object, you can see the number of pixels in the Advanced Properties toolbox. There are also some video tutorials.